Chicago — Hindman LLC announces the May 1 Fine Books and Manuscripts auction, featuring significant collections of presidential and first lady free frank covers, important aviation manuscripts, and a selection of science and medical books. These sessions, along with additional items in the categories of literature, including a collection of works by Dickens, artist’s books, travel and exploration, and other exceptional Americana, books and manuscripts will be offered in the auction and on preview in Chicago from April 26 to April 30. The collection of free frank covers most significantly features notes from George and Martha Washington. The free frank note from Mrs. Washington (estimated at $30,000 - $40,000) is exceptionally rare, as she died shortly after her franking privileges were granted. This example is one of only four of her franking signatures that are known to exist. The cover from George Washington dates to the year 1779, when he was serving as commander of the Continental Army, and has a presale estimate at $4,000 - $6,000. Additional franking signatures from James Monroe, Dwight Eisenhower, Jacqueline Kennedy, Julia Grant, and Sarah Polk will be offered in the sale. Significant aviation materials to be featured include a signed photograph of Orville and Wilbur Wright and the certificate of incorporation for the Wright Company. 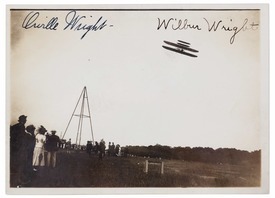 The signed photograph of Orville Wright in flight is one of only three known examples with the signatures of both Orville and Wilbur to appear at auction in the last 40 years (estimated at $8,000 - $12,000). It was taken at Fort Myer, Virginia, in 1908, while Orville Wright completed the first ever hour-long flight. The certificate of incorporation for the Wright Company, a founding document in the history of aviation signed by Orville and Wilbur Wright and their business partners, will also be offered at an estimate of $20,000 - $30,000. Highlights from the session of science and medical books include an early edition of Galileo’s Systema cosmicum, and a rare copy of Alhazen’s OpticaeThesaurus...eiusdem liber de Crepusculis & Nubium ascensionibus, a foundational work in the fields of optics and vision (estimate $18,000 - $25,000). “Our May 1 Fine Books and Manuscripts auction includes a number of fine objects representing a strong cross-section of the books, manuscripts and Americana markets, and we’re honored to bring these highlights to market,” said Gretchen Hause, Director of Fine Books and Manuscripts at Hindman LLC. The May 1 auction follows a successful series of sales for the department. The department opened their 2019 season in March with Part II of The Adventure & Exploration Library of Steve Fossett, during which several department records were broken. The auction was the second part of the single-owner sale of the library belonging to the record setting explorer, known for his achievements in aeronautics, mountaineering, racing and boating. The March 15 sale achieved a sell-through rate of 100%.The library as a whole realized over $890,000, making it the most valuable collection the Fine Books and Manuscripts department has handled. Hindman conducts over 100 auctions annually and appraises thousands of objects throughout the year in addition to handling major single-owner collections. The firm is currently accepting consignments for summer, fall and winter sales. To contact the Chicago office of Hindman LLC, visit lesliehindman.com/chicago or call 312.280.1212. Image: Photograph signed “Orville Wright” and “Wilbur Wright” taken for Collier’s Weekly by James H. Hare. 1908. Estimate $8,000-12,000.